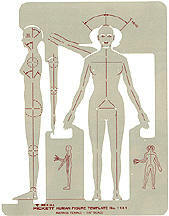 For making graphic illustrations where the relationship between a human figure and a product is required. This template depicts the average adult female and is intended for illustrating the relationship of the female figure to machinery, furniture, work area or vehicles. Scale: 1/8"=1'. Size: 7-9/16"x10"x.030"